R-PIQ is an online (computer-administered), fast, accurate, and cost-effective advanced personnel selection and security screening tool for Local Law Enforcement, Homeland Security, as well as other High Security organizations. R-PIQ is also used in the screening and selection for high risk teams and sensitive operations. The applicant sends his application to the Police Department. The application is received and can be accepted or dismissed based on the Department's needs. The R-PIQ can be customized to elicit ALL of the Departments application information (and more) via the internet and the Department's current web site. 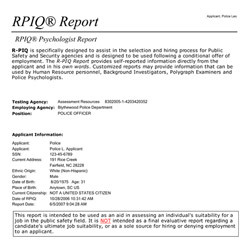 The R-PIQ Report provides the Department with a detailed summary of the applicant's life. This Report can be tailored for each application's requirements. Once again the Application can be accepted or dismissed based upon the Department's need. Post Offer Psychological assessments can be integrated with the R-PIQ to provide a comprehensive personal profile of suitability. Psychologists will be provided a secure web site and access to their agency customer applicants R-PIQ reports. Post Offer Polygraph Examinations can be integrated with the R-PIQ to provide a comprehensive personal profile of the applicants integrity. Polygraph Examiners may be provided a secure web site and access to their agency customer applicants R-PIQ reports. Combining the R-PIQ Report with the Psychological Report and Polygraph will give the Department a very strong understanding of the applicant's suitability.